Thoughts on Tokyo past and present? If I didn’t know you, I’d be absolutely positive that this was a staged photo of two old movie stars. Very cool. I agree! The framing and timing to get this picture was perfect! Waited a little while hoping the old fella would turn away from Skytree in the background, and thankfully he did. In fact they both did which was absolutely perfect. So nice when things work out like that. Certainly helps make up for the countless times they don’t! The guy kind of looks like a thinner version of Tora-san, no? Yeah, he does. I had an Ozu character in my head, but the hat in particular really lends itself to Tora-san. Thanks a lot. Really happy with result. Nah. 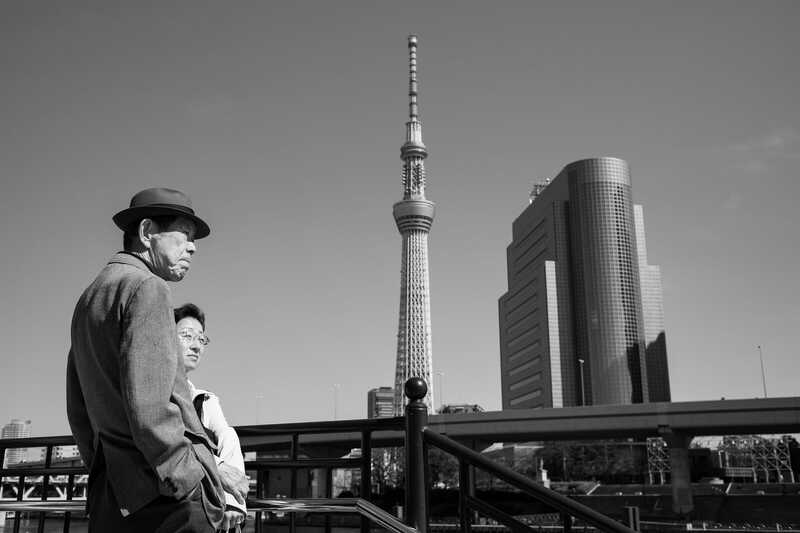 They were both looking at Skytree across the river, then they turned to look down the river. Not sure at what exactly. But whatever it was it allowed me to get the shot I wanted. I really like his hat, but yeah, if they had both been dressed traditionally, that really would have been something! Thank you very much. It wasn’t my original choice to be honest. The beautiful blue sky made for a lovely backdrop. But ultimately it had to be monochrome. Simply amazing. It’s a fantastic, arresting, wonderful shot. And you’re B&W decision – perfect. Thank you very much. Usually when I get something I know is going to be good, I sense it straight away. This one was different. In fact it wasn’t until I converted it to monochrome that I knew I had something a bit special. Fabulous picture: I like the mid 20th C. vibe of the clothing and the 21st C. vibe of the buildings. The black and white makes it even better. Thank you very much. Those elements really appealed to me as well. A wonderful contrast. And yeah, the black and white added way more than I expected. This one could be from a post-modern remake of Tokyo Monogatari. Thank you for your work, it’s always remarkable. You are very welcome, and thank you for the kind words. Yes, it really could. The first thing my wife said when she saw it in black and white was that it looked like a scene from an Ozu film. A marvelous photograph. It has a deep feel to it. Thank you. Yeah, there’s definitely a quiet, contemplative nature about it. Very pleased it came out that way. Haha, luckily that was a fair bit to the right of the frame, so don’t have to try hard to keep it out of the photo. Thanks. I was wondering if they were contemplating the meaning of foamythingy . You’ll be happy to note that Tokyo Times is the very first result when searching Google for “Asahi foamthingy”! Haha, my work here it would seem is done! Really fantastic shot. It’s like something out of a classic Kurosawa or Ozu film. I can just hear the music rising and falling in the background! It was originally shot in colour which was alright, but the moment I switched it to monochrome I felt exactly the same. Ozu all the way. Thank you very much. Definitely one of my favourites. You are doing a superb job at documenting daily sights in Tokyo now and in the recent past using photography. One thing I have considered for years is a similar effort to document the sounds heard in Tokyo. There was for a short time a radio program called “Lost and Found Sounds” which collected old familiar recorded audio files in the US. It may be of value someday to younger Nihonjin youth to hear what their city sounded like in times past. With almost everyone carrying a smartphone, any recordings could be done relatively easily as well. This is brilliant work. It makes me very happy that so many others, like me, instantly thought of Ozu. Thank you! You and me both. Very happy it has such similarities.